((Sources)) scan from albatross1 and the brushes were from Deviantart... if you can see them ^^ Tree from IManimetions... sankyuu! Uh~~! Very touchy.. (shame on me nothing to give DMNY and Jyu-Jyu...) Scenic quite romantic and nice pick on scan as well!! fav on this!! p/s: How's your exam kuro!!?? hope everything fine for you!! This is really nice, I like the background its really cool. I also like the stock you have used. and the scan is a bit grainy, maybe you should try to fix it first ^^ nice concept though :) keep up the good work !! Nice gift^^And DMNY and Jyu-Jyu definitely like romantic couple wallie. You really have changed your style I really like it. I have to agree with kara about the croping of the tree and especially about the bark it is too grainy, it really stands out. The grainy texture is perfect against the temple? and the grained picture blends brilliantly with everything. Just the small details about the tree and everything would be perfect! Tomoe and Kenshin are such a great couple what a great gift. What a nice person you are kuroisima. Bref c'est du bon !!!!! well it's good !!! WOW! That's so sweet! I love the piece! Very well done! *smiles brightly* Really! I'm so adding this to my favs. Ok, THIS is just damn great hon. Certainly is a bit different from thy older works, to be sure ;) Now on to the critiscism..sure, the scan is slightly grainy, but ye work with what you have, Ive used way worse. The only real thing that stands out to me is the tree in front. It..jumps out, dosent fit in quite as well. where its at is fine, and it should be there, but it just..jumps out ;) Sorry I couldnt be more specific, my brain`s trying to reference specific photoshop functions and getting code errors. wow very pretty kuro. i like the characters, the bg, the leaves, everything that comprises this wallie. you are so awesome. everything blended together and everything is perfect. im adding it in my fave if you dont mind. congrats on this one. 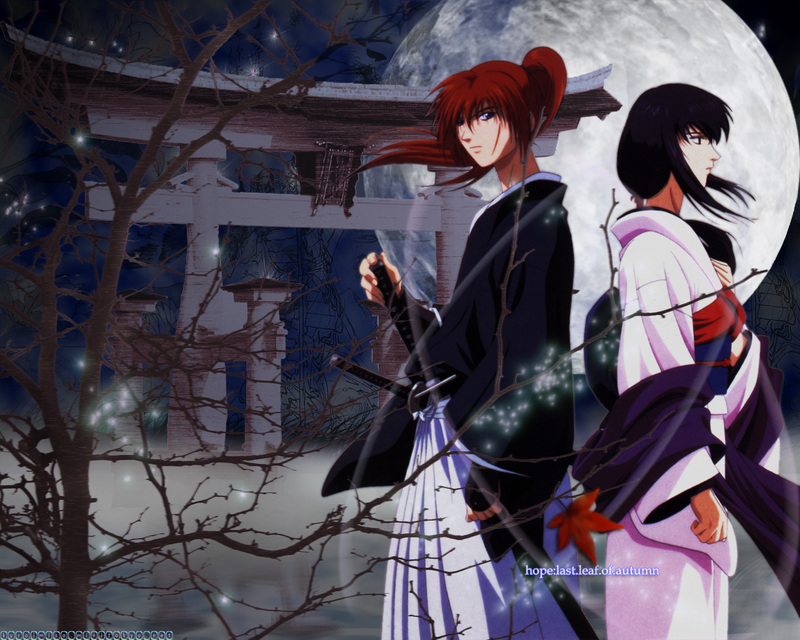 This pic sums up all the atmosphere about kenshin and the background is wonderful!!! This looks like the actual artists of RK made it. Is Kuro RK artist? Great one. No problems whatsoever, if there is, ignore them this is great!! !